Iraqi Prime Minister Haider al-Abadi says the destruction of an ancient mosque in the city of Mosul is “an official declaration of defeat” by so-called Islamic State (IS). The mosque, which was more than 800 years old, was where in July 2014 IS leader Abu Bakr al-Baghdadi demanded allegiance in his first and only public appearance following the declaration days earlier of a “caliphate”. The mosque’s destruction has brought widespread condemnation. Lazare Eloundou Assomo, deputy director of the UN’s cultural organisation Unesco, said the “iconic” mosque could have helped foster “reconciliation and peace” in Iraq in future. The Iraqi commander in charge of the offensive to retake Mosul said troops were within 50m (160ft) of the mosque when IS “committed another historical crime”. A caliphate (Arabic: خِلافة khilāfa) is an area containing an Islamic steward known as a caliph (Arabic: خَليفة khalīfah pronunciation (info. • help))—a person considered a religious successor to the Islamic prophet, Muhammad (Muhammad ibn ʿAbdullāh), and a leader of the entire Muslim community. Abu Bakr al-Baghdadi, the leader of Islamist militant group Isis, has called on Muslims to obey him, in his first video sermon. Baghdadi has been appointed caliph by the jihadist group, which has seized large swathes of Iraq and Syria. The video appears to have been filmed on Friday during a sermon at the al-Nouri Mosque in Mosul, northern Iraq. It surfaced on Saturday amid reports that he had been killed or wounded in an Iraqi air raid. It was not clear when the attack was supposed to have taken place. Experts say the reclusive militant leader has never appeared on video before, although there are photographs of him. He also said that he did not seek out the position of being the caliph, or leader, calling it a “burden”. “I am your leader, though I am not the best of you, so if you see that I am right, support me, and if you see that I am wrong, advise me,” he told worshippers. The Great Mosque of al-Nuri (Arabic: جامع النوري‎‎) was a mosque in Mosul, Iraq. It was famous for its leaning minaret, which gave the city its nickname “the hunchback” (الحدباء al-Ḥadbāˈ). Tradition holds that the mosque was first built in the late 12th century, although it underwent many renovations over the years. Most of it was destroyed on 21 June 2017, during the Battle of Mosul. Islamic State of Iraq and the Levant (ISIS) claims that the USA destroyed it, while Iraqi troops claim ISIS was responsible. Iraqi Prime Minister Haider al-Abadi stated that the destruction of the mosque was ISIS’ “declaration of defeat. It was famous for its leaning minaret, which gave the city its nickname “the hunchback” (الحدباء al-Ḥadbāˈ). Tradition holds that the mosque was first built in the late 12th century, although it underwent many renovations over the years. Most of it was destroyed on 21 June 2017, during the Battle of Mosul. Islamic State of Iraq and the Levant (ISIS) claims that the USA destroyed it, while Iraqi troops claim ISIS was responsible. Iraqi Prime Minister Haider al-Abadi stated that the destruction of the mosque was ISIS’ “declaration of defeat”. [Nur ad-Din] rode in person to its site and viewed it. He climbed the minaret of the mosque of Abu Hadir, looked down on the site of his mosque and ordered that the neighbouring houses and shops should be added to the land that he viewed but that nothing should be taken without the willing agreement of the owners. He put the Sheikh Umar al-Malla in charge of the project, a pious and good man. The properties were purchased from their owners at most substantial prices and the construction began, on which large sums were expended. The building was completed in the year 568 [i.e. AD 1172-3]. In 1511, this mosque was extensively renovated by the Safavid Empire. It is several feet out of the perpendicular, though it starts fair from the ground, and at the top, before putting on its gallery and dome, it regains an erect posture. Its attitude is that of a man bowing. When the cylindrical minaret was built it stood 45 metres (148 ft) high, with seven bands of decorative brickwork in complex geometric patterns ascending in levels towards the top. By the time the traveler Ibn Battuta visited in the 14th century it was already listing and had acquired its nickname. The design of the minaret follows a form originally developed in neighboring Iran and Central Asia and shares similarities with other minarets in northern Iraq, such as those in Mardin, Sinjar and Arbil. According to local tradition (which resolutely ignores chronology), the minaret gained its tilt after the Prophet Muhammad passed overhead while ascending to heaven. The minaret bowed itself in reverence but could only regain its balance after its top joint had been kinked in the opposite direction. According to local Christian tradition, however, the mosque’s tilt was due to its bowing towards the tomb of the Virgin Mary, reputedly located near Arbil. Both the mosque and its madrasa were dismantled and reassembled in 1942 in a restoration programme undertaken by the Iraqi government. The minaret remained unrestored, although attempts were made in 1981 by an Italian firm to stabilise it. 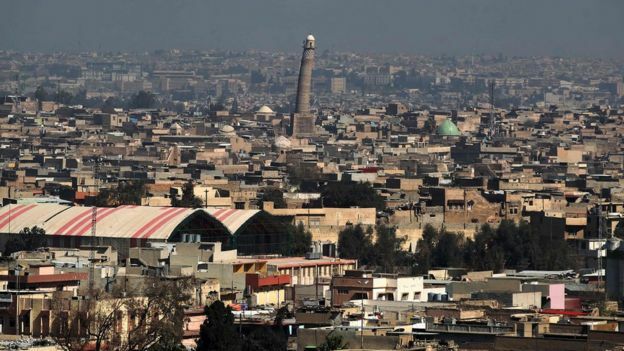 The bombing of Mosul during the Iran–Iraq War in the 1980s broke underground pipes and caused leaks under the minaret that further undermined it. The lean later worsened by another 40 centimetres (16 in). The cause of the lean was disputed – some have blamed the prevailing wind – but local officials have attributed it to the effects of thermal expansion caused by the heat of the sun, causing bricks on the sun-facing side to expand and progressively tilt the minaret. In recent years cracks proliferated along the base of the minaret, which leant nearly 3 metres (9.8 ft) off the vertical. It was listed by the World Monuments Fund as a site of concern due to the ongoing risk of collapse. The structure was targeted by Islamic State of Iraq and the Levant militants who occupied Mosul on 10 June 2014, and previously destroyed the Tomb of Jonah. However, residents of Mosul, incensed with the destruction of their cultural sites, protected the mosque by forming a human chain and forming a resistance against ISIL. Rather than destroying the site, Abu Bakr al-Baghdadi appeared during a Friday prayer in this mosque on 4 July 2014 to declare the formation of a new caliphate. 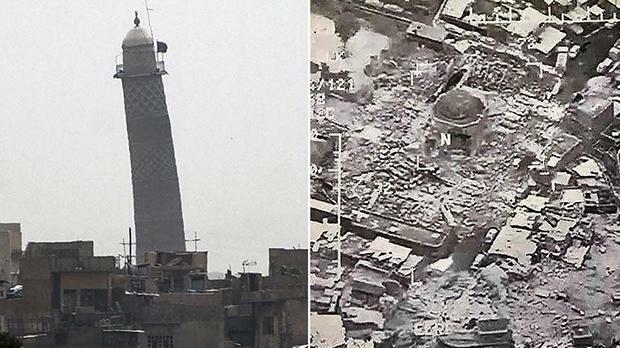 The mosque, including its minaret, was destroyed in June 2017 – according to the Iraqi Prime Minister, by ISIS fighters. By June 2017, the Battle of Mosul had progressed to the stage that ISIL-controlled territory in Mosul was limited to the Old City area, which included the mosque. On 21 June 2017, Iraqi government forces reported that the mosque had been blown up by ISIS forces at 9:50 PM and that the blast was indicative of bombs being deliberately placed to bring it down . ISIL’s propaganda ministry Amaq claimed an airstrike by the United States is responsible for the destruction, but this claim does not appear to be substantiated by any information. Iraqi forces were within 50 meters of the mosque before the explosion which appears to have been an attempt to kill members of the approaching army by members of ISIL. Aerial photos of the destruction were released by the Iraqi military a few hours later.